After having learnt my lesson in Thailand, I was determined to keep my travel schedule flexible and it definitely paid off. When I landed in Canada I hadn’t even heard of Tofino and so had absolutely no intention of visiting. However, the more hostels I stayed at the more buzz there was about Tofino and nearly everyone I met who had been there said that I had to go. Tofino is a 7 hour bus journey North West from Victoria, so I decided that after three days in Victoria, I would spend an additional three days on Vancouver Island in Tofino. Victoria. British Columbia’s capital. To be perfectly honest with you, I’m still not sure what I made of Victoria. Except whale watching and visiting various different gardens, I don’t think there was all that much to do. Calgary is world famous for the stampede that takes place in June every year. Unfortunately I was a few months too late but I decided to spend a few days in this iconic city anyway. I hope you’re sitting comfortably with a cup of tea and biscuit as this is going to be a long old post about one of my favourite places in Canada. After browsing Pinterest for hours on end, I compiled a mood board of destinations to visit whilst in Canada. One place frequented that board consistently and it was Banff. I dreamed of seeing Lake Louise, Moraine Lake, even of just being in the mountains. As I mentioned in my previous post, thanks to my severe lack of money drive and motivation for work, I decided to work for two weeks at Wild Horse Mountain Ranch so I could experience authentic Canadian life. I worked at a ranch located an hour East from Red Deer and two hours North from Calgary. Diane and Bear (the owners of the Ranch) own 180 acres of land, 4 dogs, 2 cats and 60 horses, with Summer camps on over the months of June through to August, it’s safe to say that they often need as much help as possible. My poor long lost blog. How I have neglected you. All my empty promises to try harder to post more have been unsuccessful and a little thing called life keeps getting in the way… However, I am currently sat on a Greyhound bus, 6 hours into a 16 hour coach journey and I couldn’t think of a better time to write a post. I’m looking forward to catching you up on what I’ve been up to including my trips to Dublin, Poland, Germany, Slovenia, Bosnia and Herzegovina, Croatia and maybe I’ll even get round to finishing my posts on India and Bali from last year (oops). However, if you follow me on Instagram (if you don’t follow me you can follow me @stephaniezoerogers) you will know that I am currently in Canada! To be honest, I’m not really sure how I feel about the last part of India well to be specific, our last few days in Rajhastan. After having an incredible time in Udaipur to being ripped off in Pushkar, there were a lot of mixed feelings and emotions were running high towards the end of our trip. It does not help that I was very fed up of being called Baby by Babu… So awkward. So blogging in India and Bali hasn’t gone quite as planned. Remember that post I wrote about travel technology? How I said bringing a laptop was kinda essential if you were planning on blogging whilst you travelled? Well, I should have followed my own advice. Blogging on an iPad is hard!!! I was trying to use the blogging app ‘Blogsy’ which is a great concept but I think it still needs some fine tuning as uploading the posts took foooorever and then they would have to be reuploaded when I wanted to make any changes. Basically it was a nightmare because of the terrible wifi in India. But now that I’m sort of on the way home (I’m currently writing this in an awesome hostel in Delhi) I’ll attempt to catch you all up. Luckily I had my faithful notebook to record all my travels so hopefully I shouldn’t miss a beat! Two posts in two days! Luck you! Throwing it all the way back to India again! Sorry I’ve been so lame with posts but I’ll try to catch you up as fast as I can! 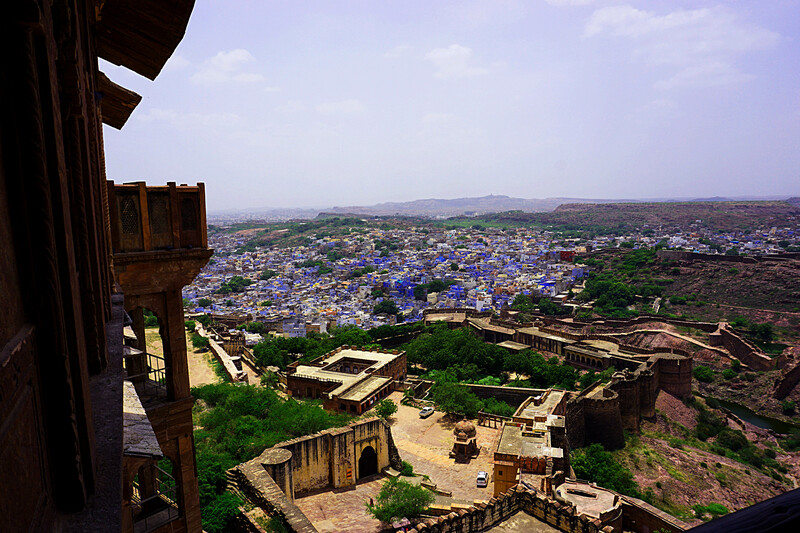 Another city, (blue this time) and another castle called Mehrangarh Fort. I’m starting to sense a recurring pattern here… I feel like forts in India are a bit like temples in Thailand, there’s one in every city and each one is not to be missed. To be fair, every fort we have seen in India has been pretty amazing.